What makes a great outdoor adventure for kids? Trees? Rocks? Beaches? Nature play? Wildlife? Yes, yes, yes! We have all these and more covered in our list of must-do bush walks and nature play spaces for kids. Encompassing a variety of habitats and nature play experiences throughout the state, you’re certain to find the perfect adventure for you family. In compiling this list, we sought expert opinions from members of our Eco Explorers Facebook community. To find out more, and to join in the conversation, head to Eco Explorers Melbourne. Heide Park is the home to probably the best climbing tree in Melbourne! A gigantic acorn tree has grown sideways and its long branches are perfect for climbing, which develops your child’s muscles, strength, coordination, concentration, sensory input, balance and problem-solving skills. There are also 15 acres of gardens and sculpture park to explore, an on-site cafe and ready access to toilets. Pack your swim suit for this one! A short, pram–friendly bush track leads from the car park to the Tunnel, where you’ll find a fantastic swimming spot and huge rocks for scrambling. Bring a picnic (there are a few tables along the way) and keep your eyes peeled for kangaroos, koalas and even the elusive platypus. Introduce your little ones to bushwalking with this gentle 1.2km bush track (2.4km return) to Sherbrooke Falls. The path leads through ferns, sassafrass and mountain ash, offering numerous opportunities for bush play and to spot birdlife, before ending at the picturesque falls. There are picnic tables and toilets in the car park. Create natural artworks in the fairy-tale surrounds of 80-year-old California redwoods. Add to the gorgeous nest-like sculptures left by David Digapony (check him out on Instagram, https://www.instagram.com/wild_and_woven) or encourage your children to create their own. Note, the closest public toilets are at East Warburton Public Hall, so stop by on your way! Home to some of our Eco Explorers bush playgroups (https://www.ecoexplorers.com.au), this wilderness in the middle of suburbia is one of our favourite places to engage in bush play. 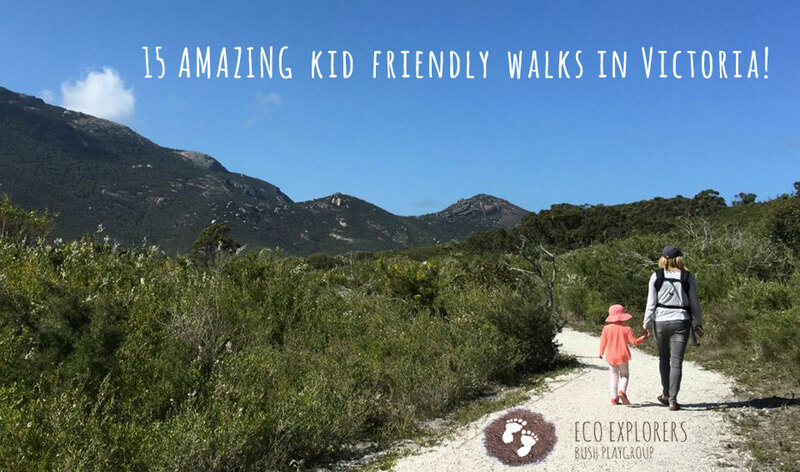 Natural playspaces and trails perfect for bushwalking with kids abound. Let your child lead the way and keep your eyes peeled for resident kangaroos! This 50,000 hectare natural paradise provides the perfect mix of beach and bush play for children. Make music running through the sands of the appropriately named Squeaky Beach, build sand castles and moats on picture-perfect Norman Beach, then, when evening falls, grab a torch and go looking for wombats (pro tip: they aren’t hard to find!). Home to another of our Eco Explorers bush playgroups (https://www.ecoexplorers.com.au) Gresswell Forest supports an astonishing number of kangaroos as well as over 80 bird species. Nature play opportunities abound: hunt for wildflowers, collect feathers, climb barefoot, or simply grab some binoculars and study those kangaroos! West of Melbourne, the You Yangs are jam-packed with huge boulders perfect for scrambling, scaling and climbing. Check out the eagle sculpture created using large stones (visible from the lookout from Flinders Peak), then create your own sculpture using the loose rocks around you. Older adventurers can access over 50km of mountain-biking trails. Bring a bucket and a swim suit to explore the many rock pools of this marine sanctuary in Melbourne’s southeast. Children might spot starfish, crabs or small fish as they maneuver their way through the rock pools dotting the shoreline. A firm favourite with Melbourne kids and not a bad day out for the parents, either! Teeming with wildlife and nature play opportunities, Darebin Parklands is a veritable treasure trove of fauna: echidnas, kangaroos, flying fox, frogs and over 50 native bird species make their homes here. Undertake a flora and fauna treasure hunt, let little naturalists loose with magnifying glasses, or indulge in some good old-fashioned bush play. This 230-hectare property on the Mornington Peninsula is an oasis for nature-loving Melbourne kids and their eco-friendly parents. Home to wetlands, numerous walking trails, an Eco Living Display Centre, a historic homestead, café and nursery, you’ll head home from this adventure with muddy boots, happy kids and a head full of eco-fabulous ideas. Located in far east Gippsland, around 420km from Melbourne, Cape Conran hosts bush play habitats ranging from heathlands to ocean beaches. Kids can clamor over giant boulders strewn across the beaches, peer into rock pools, build sandcastles, spot ocean wildlife (whales!) from the shore, or head out on a bushwalk through banksia woodlands. A fantastic introduction to bushwalking for Melbourne kids, the 700m (one-way) trail to Mason Falls meanders through towering trees and fern gullies before arriving at the lookout point over the impressive waterfalls. Pause on your way for some nature play by the creek and keep your ears and eyes open – you may get lucky and spot a lyrebird! Bush play opportunities abound in this 120-hectare park in Melbourne’s northeast. The Home Trail, a short, signed walk exploring various animals habitats, is a fantastic introduction to bushwalking for adventurers with little legs. Ride your bikes along the river trail, climb one of the many scalable trees, or do a little treasure hunting (Westerfold Park is a geo-caching hot spot! ).